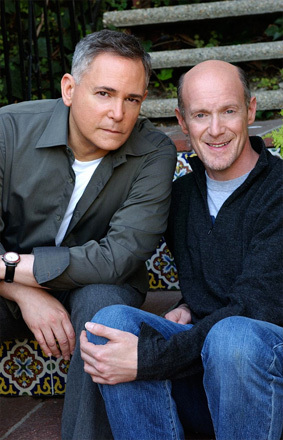 BroadwayWorld.com recently sat down with the very busy dynamic duo of Craig Zadan and Neil Meron to discuss… well, everything. They recently completed their three-year contract to produce the 85th, 86th, and 87th Oscars (the first time in sixteen years any producer has done the Oscars for three consecutive years). Of special interest to Broadway fans are the many moments of musical magic in their Oscar productions, including Barbra Streisand performing at the Oscars for the first time in 36 years, Adele’s first and only performance of “Skyfall,” Dame Shirley Bassey’s “Goldfinger” performance, the first time an entire movie cast (LES MISERABLES) performed on the Oscar stage, the first time Catherine Zeta-Jones performed “All That Jazz” from CHICAGO since winning an Oscar for her role, the first time Jennifer Hudson performed “And I Am Telling You I’m Not Going” since winning her Oscar for DREAMGIRLS, Daniel Radcliffe and Joseph Gordon-Levitt performing a song-and-dance version of “High Hopes,” Channing Tatum and Charlize Theron elegantly dancing to a special version of “The Way You Look Tonight,” the first Oscar performance by Bette Midler, a special performance by P!nk of “Over the Rainbow” celebrating THE WIZARD OF OZ’s 75th Anniversary, Idina Menzel’s first nationally televised performance of FROZEN’s “Let It Go,” the much-celebrated 50th Anniversary tribute to THE SOUND OF MUSIC performed byLady Gaga featuring an unannounced appearance by Julie Andrews, the emotionally resonant staging ofJohn Legend and Common’s song “Glory” from SELMA, and the surprise appearance by First Lady Michelle Obama to present Best Picture live from the White House (sharing presenting duties with Jack Nicholson, who was live on the Oscar stage). In this very special interview, we travel through the pair’s history from stage to screen and back again, looking back on memorable career moments. Let’s start with what’s coming up, and discuss THE WIZ LIVE! I love THE WIZ, it’s one of my favorite musicals. Neil Meron: She sounded amazing! Exactly the same. CZ: So, the very first thing we did was go to her and ask ‘Do you want to play Aunt Em?’ That was the first piece of casting that we did, putting the original Dorothy in the show. Then, we set out to cast the other roles with amazing performers likeQueen Latifah and Mary J. Blige. We’ve always wanted to work with Mary J., and of course, this will be our fourth time working with Latifah, having produced projects that she has starred in like CHICAGO, HAIRSPRAY, and STEEL MAGNOLIAS. CZ: And of course, it’s such a great pleasure to reunite with Elijah Kelley who played Seaweed in our movie of HAIRSPRAY, and Common, who we just worked with on the Oscars. Tell me about the open call for Dorothy and the casting of Shanice Williams in the role. NM: We had an open call for THE WIZ in New York and LA and we had over 600 young women show up to audition. That is a tremendous turnout and they all had a great love for the show. Of all the girls that we saw, Shanice was the best singer and actress. She also felt like a real teenager who would bring something fresh and touching to the show. What are you looking for in a Dorothy for 2015? CZ: We weren’t doing the movie version of THE WIZ, we were doing the Stephanie Mills version from the stage show, which is why we cast a girl who is 18 years old. Shanice is so excited to be working alongside Stephanie, and certainly one of the great joys for us is having Stephanie Mills play Aunt Em, because everyone you talk to who remembers the show remembers Stephanie Mills as Dorothy. They remember her singing “Home.” Having her be part of this show’s company is both nostalgic and thrilling. NM: What’s also great is working with the team that we’ve assembled, led by stage director Kenny Leon, TV directorMatthew Diamond, choreographer Fatima Robinson, musical director Stephen Oremus, music producer Harvey Mason Jr., set designer Derek McLane, costume designer Paul Tazewell, and of course Harvey Fierstein, who wrote an incredible new book. How much of the book has changed? NM: Basically, Harvey kept the structure of the original musical but added characters and made it more emotional, while also enhancing some of the original humor. While you were casting THE WIZ LIVE, you also produced your huge BOMBSHELL benefit concert for The Actors Fund. Who came up with the concept to do this as a concert? How did this all happen? CZ: When we were finishing the last episodes of SMASH, we put out a cast album of BOMBSHELL that felt like a real Broadway show. In many ways, it’s as good as any first-rate score heard on Broadway right now, and we thought it was Marc Shaiman and Scott Wittman’s best work since HAIRSPRAY. We just said, ‘Something has to happen with this.’ And then one day, we were coming out of our first meeting with the Shubert Organization. We were in Shubert Alley when we ran into Joe Benincasa, President and CEO of the Actors Fund. Of course, our first call was to Marc and Scott, who were elated. Our next call was to Joshua Bergasse, because his choreography is so identified with that score that we couldn’t think of doing it without him. We sent emails out to the entire cast to tell them about our plan and everybody said yes. CZ: Then we asked Scott Wittman to team with Josh and co-direct the show. Scott came up with the concept, which was quite smart, to use quotes from Marilyn Monroeand the people in her life as a sort of narration to glue together all the songs, since we had no book. NM: We had a big 28-piece orchestra andDoug Besterman got to do more extensive orchestrations than we had done for the TV show. Marc Shaiman also wrote an overture, which, of course, BOMBSHELL never had. We worked hard to create a uniquely original evening of theater. CZ: I remember the day before it went live, people at the Actors Fund said, ‘Guys, we really want to raise $50,000. And we really need that money to pay for the production so that all the ticket sales go directly to the Actors Fund.’ There was great concern and worry, but the next day, in what seemed like minutes after going live on Kickstarter, they raised not $50,000 but about $330,000. Everybody was in a state of shock. It was the single most successful Kickstarter program in the history of the theater, and ultimately became of one of the most successful Actors Fund benefits ever when we raised over $800,000 for that evening. Tell us about the excitement and anxiety of putting on a one-night event like this. NM: It was one of the scariest days because we had rehearsed in the studio with Josh and Scott, the ensemble, and the principal performers, but when we walked into the Minskoff Theatre at 10am the day of the show, we realized we had to go through an entire dress-rehearsal of a show that wasn’t even teched! No lighting, no sound, and nothing placed on the Minskoff stage. We worked hard all day to pull it together, broke for dinner at 5:30pm, and then at 7:30 we did the performance. Did you know that evening, with the success of the concert, that it would go on to have a new life as a potential Broadway show? NM: Not at that point, but by the next day, we knew that enthusiasm for the piece was so enormous that Bob Greenblatt, who as Chairman of NBC Entertainment put SMASH on TV and was also recently announced as head ofUniversal Stage Productions, chose to develop BOMBSHELL for Broadway. So what can we expect next from a Broadway-bound BOMBSHELL? CZ: After the summer winds down, Bob Greenblatt, Neil, Marc, Scott, and I will sit down in a series of meetings to begin the creative process and firm up the next steps for BOMBSHELL’s development as a stage show. CZ: Well, I think we sublimated our Broadway desires by doing theater in Hollywood, not on stage but by doing the movies of CHICAGO and HAIRSPRAY and also musicals on TV. We did Rodgers and Hammerstein’s CINDERELLA and GYPSY and ANNIE. Even SMASH was like doing theater. One day, we thought, ‘Wouldn’t it be great to go back to our roots.’ And that show was PROMISES, PROMISES. We started talking to our very good friend Sean Hayesand it came together in a magical way, because there was nobody that could do PROMISES, PROMISES better than Sean. Kristin [Chenoweth] said she had the time of her life. She said she related to that type of woman and when her contract was up, she said she wasn’t done with her. I thought that was wonderful of her to say. NM: Kristin really made that role her own and re-defined it. Any actress needs to stretch her wings.That’s what makes an artist. And the whole production was magical. That score is still one of the best and most innovative musical pieces written for Broadway. We had a great time and we both were very, very pleased that it was our first Broadway production, that it was a hit and that the audience loved it. I thought it was thrilling. CZ: I remember standing in the back of the theater listening to Kristin sing those Bacharach/David songs and thinking that I could stand there every night. NM: And to see such an inspired comic performance by Sean Hayes. What he did with the physical comedy wasn’t even in the script. You’re always great at casting, too- can you talk about your process? NM: It sometimes just falls into place. You just kind of spitball and you try to think of actors spreading their wings. CZ: When we went to Judy Davis and said, ‘We want you to play Judy Garland in the mini-series LIFE WITH JUDY GARLAND,’ she was shocked, but we just had an instinct about her. In fact, we said to Lorna Luft, who wrote the book that the movie was based on, ‘We will only make the movie if Judy Davis plays Garland.’ And luckily, she said yes and we made the movie. You brought live musical theater back to television. How did that all happen for you with NBC? CZ: After moving into musical features like CHICAGO and HAIRSPRAY, we were reminiscing one day about how we brought musicals back to TV, starting with Bette Midler’s GYPSY. Then Neil said, ‘Remember fifty years ago, when they were doing live TV musicals?’ So, we thought, what if we did the stage version of THE SOUND OF MUSIC as a live TV event? We had no interest in remaking the movie because you can’t and you shouldn’t. It would be sacrilege. But giving the original stage show a new life in a new format felt like a rewarding challenge to take on. NM: After SMASH, Bob Greenblatt came to us and said, ‘I need something for the network. I need something noisy, press-worthy, innovative, something that has not been done. So, if you think of anything, call me.’ It was then that we brought up THE SOUND OF MUSIC and he said, ‘Let’s do it!’ We are forever grateful to Bob because he has allowed our work to continue and grow. And hopefully, it will continue for a very long time. What are your fondest memories of THE SOUND OF MUSIC experience? CZ: I remember thinking that the telecast would be stressful and terrifying, but because it was so well-rehearsed, it felt like an ordinary run-through. The reason for that was that there was no audience, it wasn’t in a theater, it was on a soundstage and there was no pressure to perform for anyone. We just did it, and then it was over and it felt good. NM: Still, there was something very special in the air that night. I think everybody on that sound stage felt it. It was amazing. And then to wake up the next morning and see the ratings? It was overwhelming. CZ: 22 million viewers. No one expected it. Let’s talk about HOW TO SUCCEED IN BUSINESS WITHOUT REALLY TRYING. CZ: We had heard that Dan [Radcliffe] was taking vocal lessons. We had a friend in EQUUS who said, ‘You know, backstage all night, Dan sings the score from SWEENEY TODD.’ So we went to see EQUUS, went backstage to meet him, and said, ‘Do you want to do a musical?’ He said he was dying to! We made a vow, right there, that we were going to meet for dinner or lunch over the next six months and we were going to find the right Broadway musical for him. CZ: Well, I would say that first of all, if you have the honor of being chosen to produce the Oscars, you usually get only one crack at it. We were the first people in sixteen years to do it three times in a row, and it was one of the most profound experiences you could ever imagine. What we learned was that producing the Oscars requires three different skill sets: having a love and understanding of the movies, knowing how to produce a television special, and being adept at producing a live stage show. It was the first time we got to use all three skill sets for one project. Our goal was to bring live entertainment back to the Oscars. Okay, we have to talk about Lady Gaga and THE SOUND OF MUSIC. NM: When we did the show this past year, we knew we wanted to do a musical celebration of the 50th anniversary of THE SOUND OF MUSIC. We wanted to do a contemporary take on a movie that was 50 years old, and we knew thatLady Gaga was one of the few young performers who could pull it off. CZ: We knew that the worldwide audience watching the show at home was not ready for what they were going to see and hear from Gaga. Meanwhile, Neil took on a very special project to persuade Julie Andrews to appear at the end of Gaga’s medley and surprise the audience. It was a full-circle moment. Julie agreed, so the night of the show, we snuck her in the back door so that no one knew she was there until she walked out on stage. It was an incredibly emotional moment and the audience burst into tears. The audience was also very emotional during the “Glory” number this year. CZ: It was a chance to use our theatrical experience to help enhance and celebrate John Legend and Common’s already gorgeous nominated song from SELMA. Oprah, who produced the film, came in and asked, ‘Well, what are you going to do?’ And we told her we were going to build the bridge from the film. She said, ‘You’re going to have a projection of the bridge?’ And we said, ‘No. We will build that bridge.’ So Derek McLane built the bridge and Rob Ashford staged the performance exactly like a Broadway production number. 80 African-American choir members marched over that bridge and it was as powerful a moment as we had ever put on stage. Looking back, how do you feel now about your experience producing the Oscars? NM: We look at our legacy now. We had a three year contract which just ended. All three shows were tonally very different because we had three unique hosts and we structured the shows around their particular talents. CZ: The reality of producing the Oscars is that it’s a blood sport. With social media, everyone has a chance to voice their opinions. You have to know that entering into this special world requires a very thick skin. You also must be aware of the fact that no matter who hosts the show or how good the show is, the show’s success, especially in regard to the ratings, has mostly to do with the box office success of the movies that were released that year. So, there are a lot of things that you have control over and a lot of things that you inherit with the job. The one takeaway that remains is that you had the honor of producing the biggest and most prestigious television special of the year. In the end, that is the memory that lives on for us as we move forward to exciting new projects in film, television, and Broadway.